Warne Tactical Rings are made to 1913 mil-spec Picatinny (Weaver style) dimensions. They feature a stainless steel recoil lug, three torx style fasteners on top and a Hex style clamping nut that works with a 65 in/lb torque wrench but, also fits a socket wrench, crescent wrench, or pliers in an emergency. The Quick Detach system always returns to zero when removed and re-installed. Set up different scopes on the same rifle and change with the shooting conditions... Or, just use the QD feature rings to bring along an extra "just-in-case" already sighted in back-up scope! 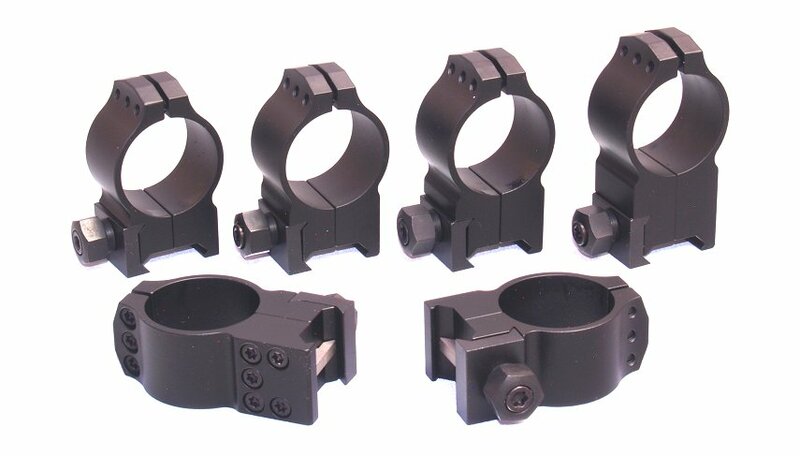 Tactical Grade Strength, Rigidity, and Alignment - These rings are actually designed to meet the demands of combat sharpshooters and snipers. Extremely tough and made to enhance the accuracy potential of your rifle and scope! We also have Warne Tactical bases... See our Warne Tactical Page. 614M Medium .440" 616M Extra High .650"
615M High .525" 617M Ultra High .850"